Are you too shy to go to a real party and meet someone? Want to do it from the comfort of your own home? Maybe invite some friends to join you too? Meet Shaker, it is this year’s Tech Crunch Disrupt winner. 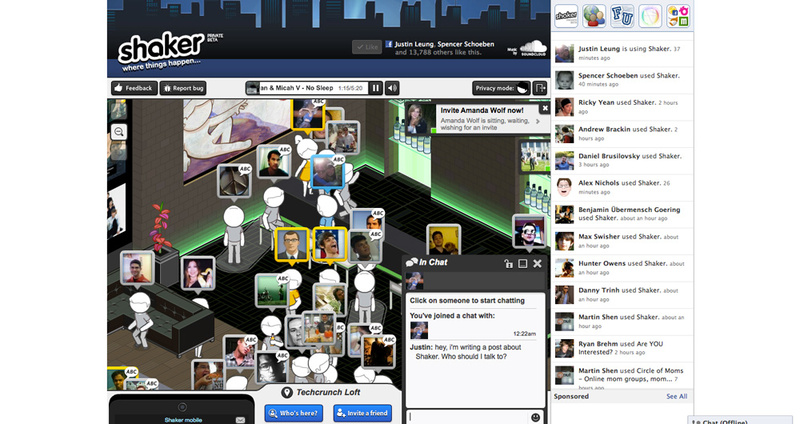 Shaker is a Facebook App which creates an online party with music, drinks, and drunk texting all included. I stumbled upon it when one of my friends tweeted about it. See? Social media does work. I opened the Facebook app, authorized access to my account, and clicked to join the Tech Crunch Disrupt @ Shaker party. It then prompted me to choose my privacy settings: Shy, Normal, or Friendly. I chose Normal, why not? Shaker takes inspiration from the layout of a bar or club where users can approach people, buy drinks, or even text a girl across the room. The web app even has a cellphone for awkwardly playing snake while standing in a corner waiting for your friends to arrive. The cell phone, modeled after the iPhone, both in aesthetics and functionality sits on the bottom left of the screen and expands up. Besides playing Snake, the cell phone has a few other functions: a profile viewer of people you meet, a list of the attendees of the party, mutual connections to others in the room, a Twitter wall displaying the newest tweets from people at the party, a Facebook like button, private messaging, settings, and a tool to invite friends. On the right bottom part of the screen is a chat screen which expands when your avatar is in conversation. At the top of the screen are a set of music controls and details about the current song. For a few minutes I explored the surroundings by clicking to move my avatar. I found a Twitter wall mirroring the functionality offered by the cell phone and an interactive wall propagated with pictures of musicians, TV shows, movies, books, and anything else you can like on Facebook. Profile images appear above each avatar. Those avatars have a gold outline for friends of friends, grey for strangers, and blue for your friends. A notification appeared on the cell phone telling me I received a drink and message from Rebekah Austin of Pop17.com. In the message she asked how I knew a mutual friend and we private messaged back and forth about Shaker while two friends approached my avatar and engaged in conversation. We spent a few minutes talking, but it was hard to keep two conversations going so both conversations came to an end as it would in real life. I spent a few more minutes exploring the party, but did not find anything else so I left. My take away? Great music, interesting company, and perhaps a new friend. Shaker is able to emulate the organic nature of a party and actually lets you meet people you have something in common with. It also has pre-written conversations starters like “How do you know Jack?” With the tag like “Where things happen.” Shaker seeks to eliminate the normal social awkwardness which prevents some from making conversation. The question that remains: Will Shaker translate to anything in the real world or just stand as the chatroom for this generation. More importantly: Will things happen?